Home > Daisy, Health Care - Dogs, Pet Ponderings	> Is Daisy too thin? Over the past few days I have received several comments from people about Daisy’s weight. It’s not the typical “your dog is fat” comment. No. The comments from both family and friends have been “Daisy looks really thin.” or “Daisy is looking pretty thin.”. How odd it is to have people tell you your dog is too thin. To be honest, it kind of made me a little paranoid to hear so many comments in such a short period of time. Was Daisy too thin? Was I not feeding her enough? Should I be feeding her more? I started to feel bad. Was I being a bad dog mom? When I first brought Daisy home, she was way too thin. You could see her ribs. But then, after she had a chance to eat plenty of food, she got way too fat. Today, she looks like this. 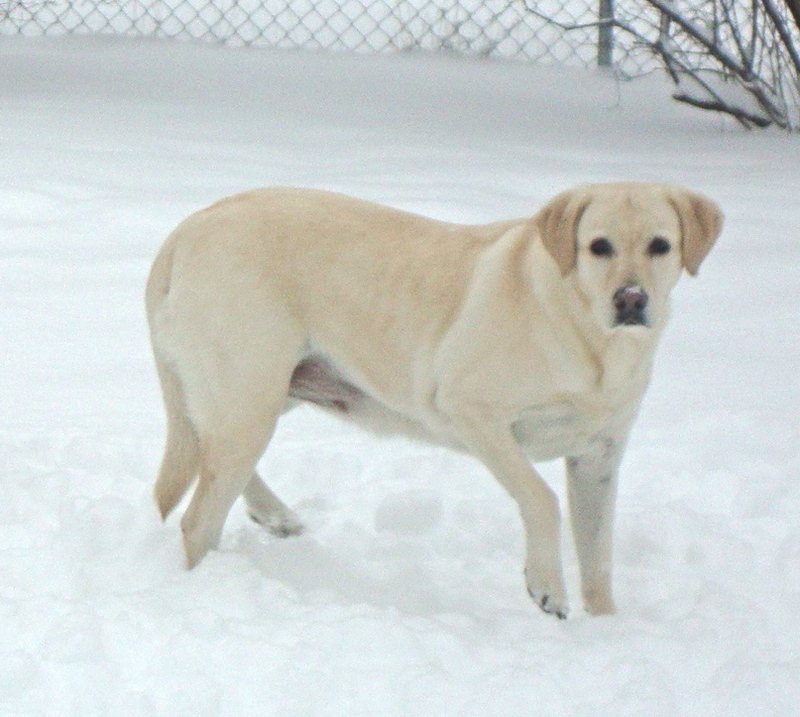 Having seen way (WAY) too many fat Labs in my life, I have always tried to keep Daisy at a healthy weight. When she was too fat, I got concerned about what that would mean for her joints and energy level. I didn’t want her to be one of those older dogs, waddling along, hardly able to go for a walk around the block. She’s 9 years old now and arthritis is a real possibility. Extra weight would not help her in this area at all. But, all the recent comments made me wonder if I was keeping her too thin. Should I add some food to her dish each morning and evening? This past summer I saw a body condition chart at a dog adoption event and I remembered wondering where my dogs fit on that chart. Surely I could find one online and see where Daisy fell on it, right? It turns out there are several variations of the body condition chart online (see below), but Body Condition Score chart I like is one on the Hospital for Companion Animals. So where did Daisy fall? Using images in the first chart (above), I determined that she fell within the ideal weight category. On the second chart, she scored between a 2 and 3 – which falls anywhere from thin and an ideal weight. And, on the third chart, she scored as “moderate”. So is Daisy too thin? I don’t think so. She’s healthy and happy and looking like a dog at a healthy weight. Is it possible that we have gotten so used to seeing overweight and obese dogs that our view of what a healthy weight looks like on a dog has been skewed? Maybe. It’s hard to know. But, to be sure, I am going to take her into our vet and see what she says. I think that will give me more peace of mind. What about your dog? Do you get comments on their weight? Too thin? Too fat? I think Daisy looks great! 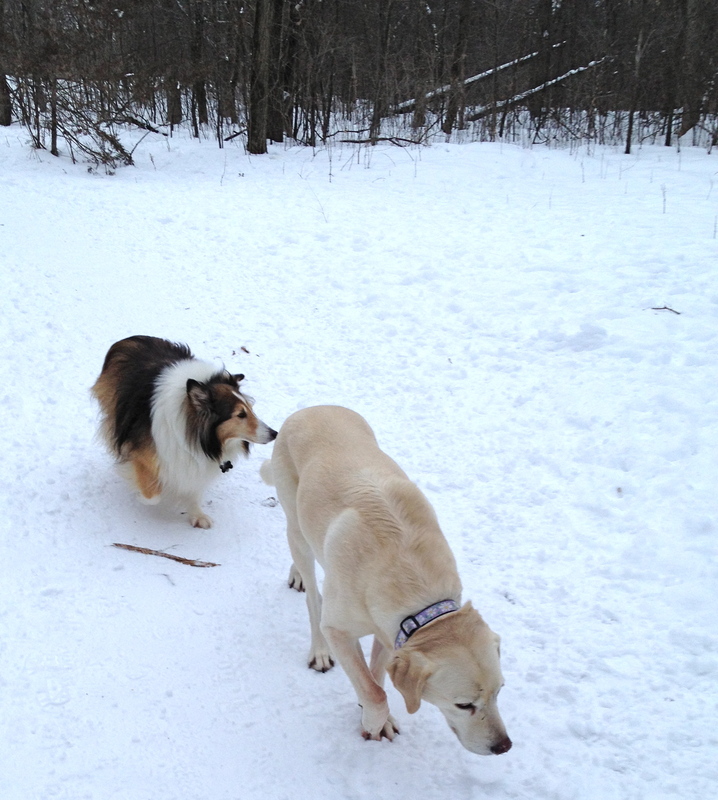 Obesity in dogs is rampant….. My Gracie had two knee surgeries, so I kept her on the thin side as well. I have a friend with a Rottweiler who had such bad arthiitis at age 4 and he also had to keep him on the thin side. It’s something I think about. Thanks for your comment. It’s nice to know I am not the only one going through this. I think worrying about her joints at her young age is smart. It means you are thinking of her future, not just where she is at today. It’s a bit nerve-wracking to wonder if they are to thin though isn’t it? Thanks Katie. As a former pet sitter, I saw way too many fat dogs too. It always made me so sad. It’s nice to know that Daisy looks healthy. She loves food, but that shouldn’t be a reason to give it to her all of the time. I think we have gotten to used to seeing fat dogs. She looks great from the top but if her sillouhette has changed over the last few months please get the vets approval? We thought we were caring for Petunia who had gotten a little chunky and paid no mind when she thinned down. Then she was vomiting and the vet found a mass in her belly. It wasn’t our “care” that helped her “get healthy”, it was our heads up our tushies. Maybe I’m just paranoid. I’m constantly palpating Fletch’s belly these days. Like its my fault, something we fed her or something. I know you are way more observant, but thanks for letting me express. Thank you for sharing! I think it is always good to make sure if a dog your dog is losing weight due to a medical issue. 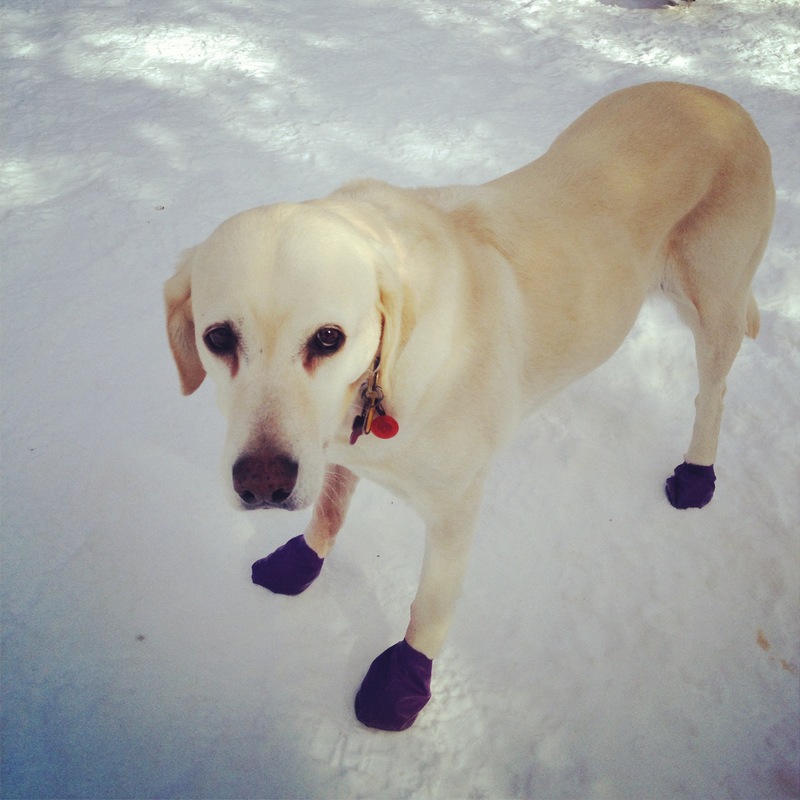 I have been very conscious of this with Daisy since Labs do have a risk for cancer. But, she eats healthy and acts normally so I think she is fine, but I will definitely ask the vet. Daisy looks ideal to me. I hate people who comment with no real understanding. A lot of people tell me my almost 13 year old cocker spaniel is way too fat (we got her last year as a rescue). It pisses me off. I say that could be, however I think it is the huge benign tumor on her side that is inoperable – here – feel it! It shuts them up. She has a normal body weight even with the tumor. And this old, feeble dog hikes the mountains for at least 2-3 hours 4 x a week. More than all of the people who comment on her looks. Yes. People are used to seeing fat dogs as “normal.” I think she looks good, but if her actual weight is dropping, then definitely ask your vet. Thanks Roxanne. I don’t think her weight is dropping. She looks the same she did a month ago and a month before that. I went back through some old photos to be sure, but it definitely was something I wondered after the more recent comments. I received comments about her weight a couple of months ago too, but not all at once like recently. She looks beautiful. And I’ve always thought so in your pictures (when she’s not camouflaged in the dog park). So many labs are fat (they do have a reputation for big appetites) that I think the breed is more expected to be heavy. 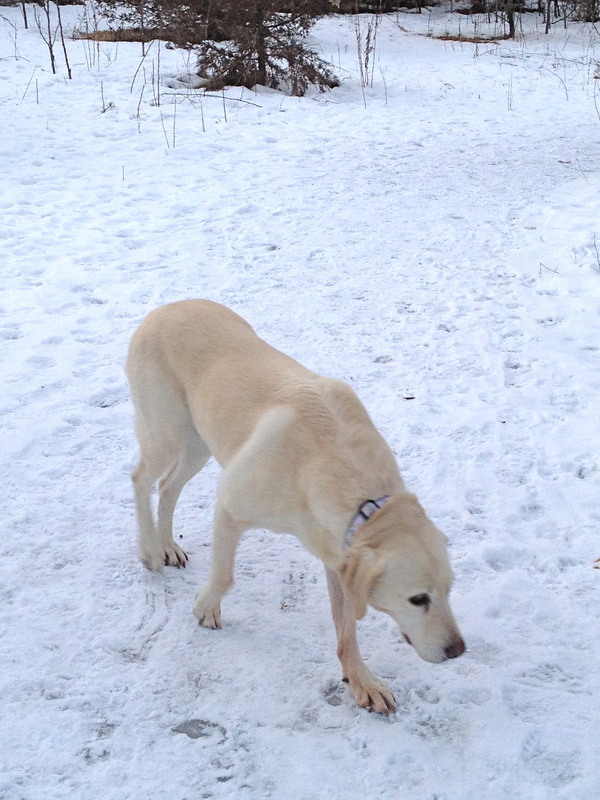 A normal weight Daisy does look odd compared to the average fat lab. BTW, it usually happens when we’re doing active stuff like kayaking and hiking. Yes, people, there are fat people who are in good shape, along with their dogs. Thanks for making me laugh Pamela. I love that last statement. LOL! 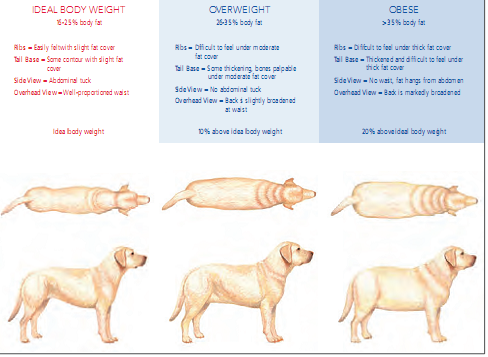 I agree that a normal weight looks odd when so many Labs are overweight. I don’t think anyone meant to insult you. You guys are very active and fit. I remember when my sister and I decided to climb to the Tea House at Lake Louise in Banff. People were shocked that two fat girls made it all the way to the top! She is beautiful. 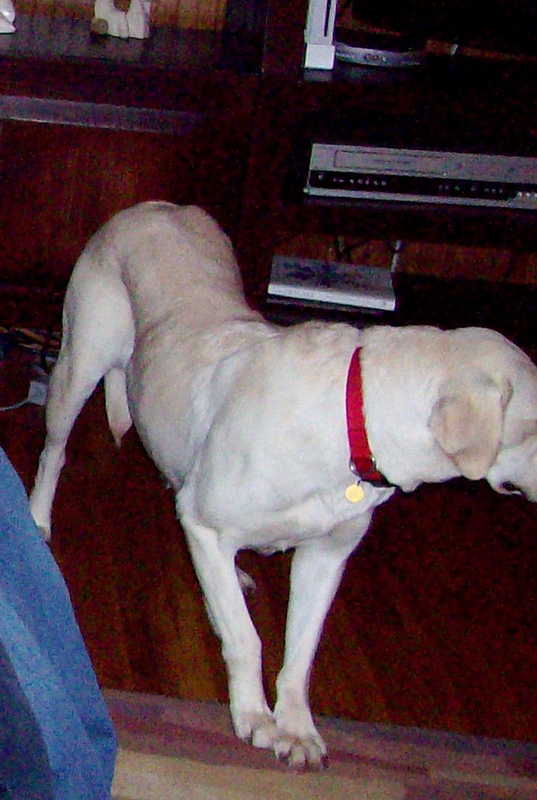 Our lab is 13 and thinner than she has been most of her life – mostly cause our kids are grown up and not slipping her constant snacks anymore. She had started to get a bit lame on hikes probably 3 years ago. The weight loss took pressure off her joints and she can now still do short hikes (not in the snow) at age 13 without getting lame so for her thinner gained her 3 years of quality of life. 13! Wow! I hope I have Daisy at least that long. I think it’s awesome you chose to kep her on the thin side to protect her joints. I have no doubt that you got the 3 extra years because of it. Kudos to you! I’m contradicting myself now, but my husky who passed 2 yrs. ago at age 14 actually lost about 15 in the last year but I think it was due to a diminished desire to eat (she never really had a great appetite). I think It was uncomfortable for her to eat due to a malignant tumor on her gum. Eventually it started bleeding, and her hips and rear quarters had been failing her too so I made the decision to let her go before she was really in pain. It was hard to tell because she was just as active (as much as her body would allow her) and alert and happy as when she was a pup. That makes it very hard to judge when it may be the right time. People have accused us of letting Hailey be too skinny too (including my mom who was insistent I was starving my dog). We talked to our vet who said he was perfect. Now, when Zaphod came to live with us, he was too skinny. He was found as a stray and was about 25 lbs under his ideal weight at rescue time. We did have to put a little weight on him, now he is perfect too! I do think people tend to think overweight is ideal in pets and humans. Now I admit I do have 1 overweight cat, but he is almost 18 and has some other health problems so we are just enjoying him. We are not worrying about diet at this time. I hope in my 80s I don’t need to worry about it either! Poor Zaphod. I am glad he is at a healthy weight now along with Hailey. I think people do too. Overweight is the new norm so people don’t know what healthy looks like anymore. I have a 19 year old cat and completely hear you on enjoying his time. I feel the same way. Thanks for this post – our dog falls between a 2 and 3 on that last chart too – right where your Daisy is. We had wondered if she was too thin as well, but our vet said no, she looks great. She eats alot and I think she must just have a really high metabolism. At any rate, I think Daisy looks great! Daisy looks like she’s at a healthy weight to me, especially for her age. I’ve observed when dogs get older they seem to put on more weight. I think the older they get the more food obsessive they become. My 6 yr. old lab mix is a good weight but my 8-9 yr. old small mix is shamefully overweight. I have been trying to cut down on her food intake but she is so focused on food all day long that it’s hard to deny her (my fault, I know). How interesting Martie! I haven’t seen the same in Daisy, but I will definitely be watching to see if she does become more food obsessed. It’s hard to deny them and it’s hard to see them age. I have been known to sneak her a treat or two because she is getting older and because I adore her. I wish you much success with your girl. Honestly I think she could use maybe 2 pounds but as long as she doesn’t act like she is starving ( beyond the lab munchies) then I wouldn’t worry about it. Thanks Carma. I’ll ask the vet when we see her tomorrow. I will be interested to hear what she thinks. She looks perfect, Mel. You’re a great mom! Daisy looks great to me. Much better a little lean than over weight. She will live longer for it. Both my dogs came to me extremely thin. Even with their heavy coats you could clearly see hips and ribs with no muscle mass. Max is a over weight now and it’s hard getting the weight off especially when the spouse don’t agree he is over weight. He has a waist but I want him on the leaner side. We are working on it (at least I am), but it takes time to get it off. I agree Carole. In fact, I would not be surprised if the vet said a couple of more pounds lost would be better. She has a barrel chest from all those puppies, so I think it makes her waist look smaller than average. I have had other friends who have struggled with a spouse who thought their dog isn’t overweight and keeps feeding them. It can be so frustrating. I hope you are successful with Max. Oh Mel, I have been there way too many times to count. I used to take it so personally and really did worry my dog wasn’t getting enough nutrition. But after consulting with many vets who say she is perfectly healthy for her body type and energy level, I am refusing to listen to the “tsk tsking” of others in respect to her body size. It’s really none of their business anyway and I don’t know why they think it is appropriate to comment on her body weight. Would they comment on my child’s? I know you have Kristine! I always thought Shiva looked healthy, not too thin. I don’t think anyone meant to make me feel like Daisy was starving or anything (because she most certainly is not), but having so many comments at once made me second guess myself. I am glad to know I wasn’t wrong. WHew! 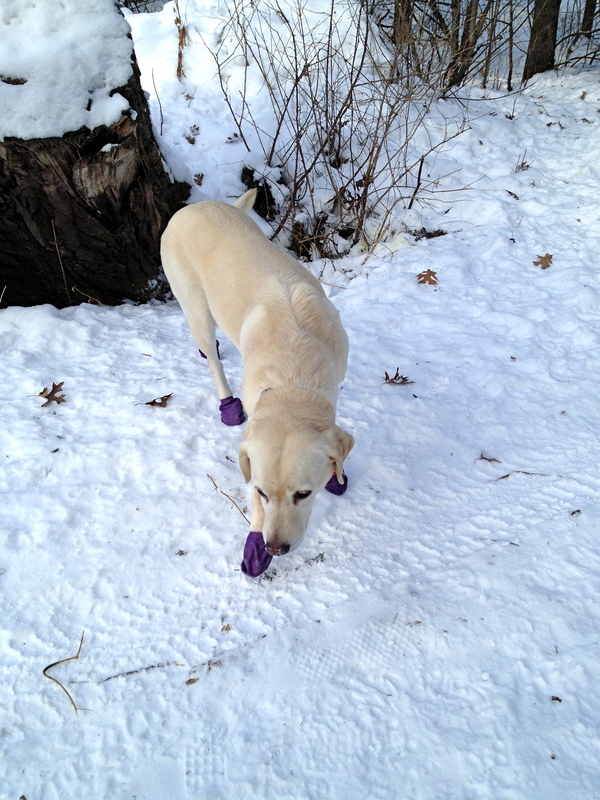 Daisy looks like a lean, fit – and happy – lab. Good job! Same thing happened with Eko – he was always very thin, but in shape. When he broke his foot some knuckle head kept feeding him the same amount of food even though he couldn’t exercise much for nearly two months. He got on the heavier side for a while but is no close to back to his ideal weight. 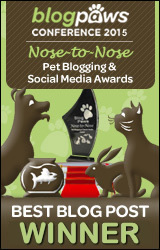 Very great post about an issue all people with pets should consider. Glad to hear Eko is back to is formerly thin self. BTW – I did the same thing with Jasper when he tore is nail and couldn’t run like he usually does. You are not alone in making that mistake. I think she looks perfect Mel! And you hit the nail on the head with that last statement. We are so use to seeing overweight pets (as well as people) that we tend to critique smaller beings as too thin. I think as long as she feels good, that is what is important!! Thanks Jodi! It’s funny, but I was thinking of all the Labs I know at our dog park and how many were a good weight. Sadly, I could only think of 2 or 3. People may be trying to help. Many times an owner doesn’t the weight change. I have owned a cat sitting service since 1975 and have seen changes in cats from one time to another. I do mention it to the owners because I am concerned. There are medical reasons for weight loss. Owners usually recognize it after I point it out and in more than one, occasion the cat was diabetic or had renal problems. The cats were saved because I noticed a change and took the time to tell the owner. I used to do the same thing BJ Pup. I always hated to see a dog or cat overweight because I knew it meant a diminished quality of life. Good for you for telling your clients! 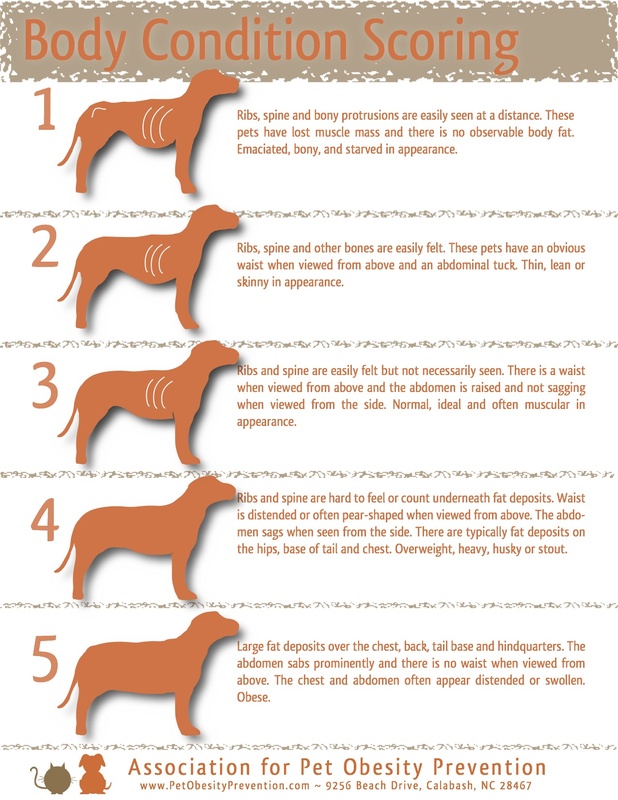 I have seen that chart, too… At our vets! And they are supposed to have that small waist. I agree she looks great. You rock Remy! Thank you! She looks to me how a lab should – not how many do. Thanks Katie. I agree. The only other Labs I have seen Daisy’s weight are my friend Kim’s dogs. Kind of sad when you think about it. She looks great! How well do those booties work? Our husky is having a terrible time with his footing lately. The booties work great! It might be worth getting them for your Husky. These are the only ones that Daisy doesn’t mind me putting on. They also stay on and she doesn’t walk funny in them, which tells me that she finds them comfortable to wear. They are called PAWZ and sell for about $12-$15. I know Petco has them, but you can also find them online. She looks like a healthy Labrador to me. People may not know what a healthy Lab is supposed to look like, since so many of the ones we see are overweight. Same with Shelties. If she is maintaining her weight and has good energy, keep doing what you are doing. I’d rather see a dog on the slender side – much better for long-term health and mobility. I think she looks great! Not many 9-year olds are so trim – she could be a model! I don’t think Daisy looks too thin at all! It’s good you keep her at a healthy weight, overweight dogs have too many medical issues and I’ve seen my fair share of overweight dogs. Thanks Gracie! I have too. It always makes me sad when I see an obese dog. Those are the ones really suffering. People tell me that Elka is too thin. Elka is not too thin, and nor is Daisy. I think we ARE too accustomed to seeing fat dogs, that seeing a fit one is unusual. I think Daisy looks lovely! Thanks Alex, Trish and Penny. It can be hard to get a dog to lose weight – just look at Daisy at her fattest! Vizslas can be hard to maintain too. I think that Daisy looks great! Dexter on the other hand, Skeletor. Thanks Karen! Why is Dexter so thin? Has he got one of those crazy metabolisms that just burns everything off? I think Daisy looks a very good weight and that you’ve done a great job getting her there. I also think you’re right about people being too used to seeing overweight dogs (and humans). We used to frequently get comments that Rufus was too fat (though he was actually thin under his coat – we had to keep him underweight for his leg and spine issues). Some people now say Georgia is too thin (though the vet says she’s perfect). I watch her diet and weight like a hawk because she scavenges so much food on her own! Anyway, having had personal experience with the health issues that can come with overweight dogs, I’d rather err on the side of them being a kilo or 2 under than over. I think Daisy looks thin. But, I dont think she is to thin. I have learned that this seems to be a difficult topic. My dog needed to see the clinical nutritionist at the U of M. She thought Lucy was to heavy. We worked on it and she lost 5 lbs (a fair amount when you only weigh 25lb to begin with). After getting her to that weight I went to see my vet. She said that Lucy was thin but ideal. She said that the Dr. at the U likes to keep dogs very lean. And, with reason. Dogs at their ideal weight have less medical problems as they age and actually live longer than heavy dogs. I want to keep my dog healthy and with me for as long as possible. I get comments about my dogs weight too. Talk to your vet, get a comfort level that she is OK, and then when people say something you can say something back to them or just smile and thank them for their concern feeling confident that she is OK. Good topic today!! It looks like I may be in the minority here. Her but looks a bit boney. But at 9 years of age it could just be the canine version of buttless silhouette that people get. There are two major schools of thought in human medicine so lets see how well they translate. Being 10 to 15 pounds underweight is associated with some longevity and quality of life as measured by activity level. Here is the ‘other hand’; if there is a cancer diagnosis and chemo or radiation therapies are instigated, then 10 to 15 extra pounds gives some extra time and energy. How do u think that this related to Daisy? Point well-taken. I agree that weight can make the difference in that situation. In this case, there is no relation at all. I have been working to reduce her weight to a healthy one. I verified with the vet when we saw her today that Daisy is not too thin, but at the perfect weight for her breed and size. She is healthy, happy and active. She loves to run through the woods. I think she looks great! Labs are such chow hounds (that’s why I had to have Kona be a Lab in What the Dog Ate!) 🙂 We had a beagle – also known for getting portly. But we used to run a lot with ours, and she was obsessed with chasing the laser light, so that kept her in crazy-good shape. She would literally bounce off the walls, and every time we took her to the vet she’d say “Your beagle is in such good shape! She has great triceps!” I didn’t even know dogs had triceps! Our vet also told us it is better for a dog to be a tiny bit underweight than even a tiny bit over. It can add a year or two extra to their life span. So I think Daisy looks perfect! Your dog is looking great. Keep up the healthy diet. I think she looks great!! I’m sorry that people are making you second guess yourself! Thanks Julie. I think I may have made one friend feel bad for asking. I hope not. I just had received so many comments that day that I started to wonder of I was making Daisy too thin. Her vet reassured me that she is perfect where she is right now. Do pets really tell you when it's time to say goodbye? © Melissa Freer and No Dog About It, 2009. Unauthorized use and/or duplication of this material without express and written permission from this blog’s author and/or owner is strictly prohibited. Excerpts and links may be used, provided that full and clear credit is given to Mel Freer and No Dog About It with appropriate and specific direction to the original content.